Packaging wise again is as elegant as the whole Daily Face Care range as it comes in a classy glass pump bottle with a plastic cap for hygienic purposes. Words are printed bold and clear on the packaging paper like the others. As it comes with a pump, dispensing amount is consistent with each pump. Again, as it comes in a glass bottle, it is not travel-friendly. In order to bring it along for my travels, I needed to transfer a little into another plastic bottle for more convenience. WHY NEED TO USE SUNSCREEN? When it comes to skin care, most people are aware of the basics; daily face cleansing, toning, and moisturizing. But many lack the 3 most important things we can do to ensure our skin will look its best over our lifetime; Exfoliation, Hydration, and Protection. There are 2 types of ultraviolet radiation: UVA and UVB. Using a sunscreen is one of the best way of protection. Apply 30 mins before going out into the sun. Re-apply every 2 hours or after swimming or strenuous exercise. 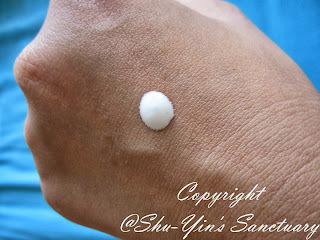 Water based sunscreen - For people with oily skin or acne prone skin. UVB is peak between 12noon to 2pm - Avoid the sun during these hours. Your chest, neck and hands need protection too! This is a sunblock formulation with SPF30+. It has broad spectrum protection, and thus protects the skin from the burning effects of UVA and UVB. It as a white milky texture, and is not too thick. One pump of the bottle actually dispenses quite a lot. That one pump is enough for my entire face, and also my neck. So, a little goes a very long way here. 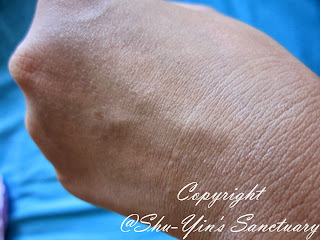 As it is not too thick, it absorbs easily into my skin. And it is also non-greasy, which is another plus point for me. I hate greasy feeling especially on my face. Now the thing I like most about this sunscreen is that it has no plastic-y smell, that I always associated all the sunscreen with. Last time, whenever I slabbed some sunscreen onto my face, I detested the plastic-y smell. But this BOV Sunscreen Organics has a pleasant floral smell, that I thought I was using a moisturizer, and not a sunscreen. Double thumbs up! Although it is not travel-friendly, I still brought it along with me on my most recent Singapore trip. However, I pumped some into a plastic container (I fear that I would break the glass bottle). We were mostly outdoor the whole time in Singapore, and we walked everywhere using the public transport. So I was really glad to have brought this Sunscreen Organics with me. Even with so much outdoor and in the sun, I did not experience any sunburn, and I saw no extra freckles popping up after my trip (unlike the last time when I went to South Africa!). So through my experience, this sunscreen is as good as it claims in protecting my skin! I am pleased to announce that Blue Oak Valley is sponsoring 1 bottle of Sunscreen Organics (30g) to a lucky winner! Giveaway ends on 6th December 2013 (Friday) 11.59pm Malaysian time. Please fill up the Rafflecopter below to earn entries for a chance to win this giveaway! * Disclosure: I received the Sunscreen Organics (30g), for review purpose, but no monetary incentive was received. All text and opinions are of my own and represents my honest opinion of the product(s). The glass pump bottle is so convenient for busy mom like us. One pump and we are ready to go out in the sun :) Hope lucky star is shining on me and thanks for the chance! 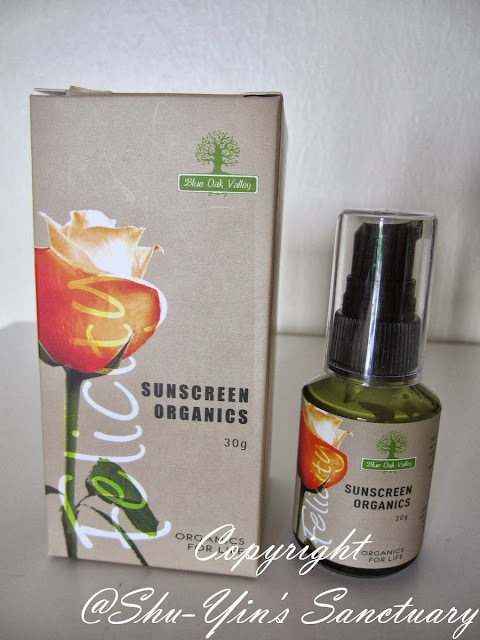 Wish to win this bottle of Sunscreen Organics! Yes, agree with Cindy Lee! This really so convenient for busy mom like us. Thanks for the chance of winning!